Let’s take a closer look. Billboard reports that Man of the Woods moved 293,000 equivalent album units. An overwhelming number of those—242,000, or 83 percent—came from traditional album sales, meaning people left their homes, went to a store (not Best Buy though), and bought the dang thing. Well, actually, only a small number of people did that: 89,000. Most bought it digitally (139,000) and—hello!—a tiny fraction of people (15,000) bought it on vinyl. Man of the Woods! On vinyl! Based on those numbers, I can discern that the majority of people buying Justin Timberlake’s album are middle-aged, kinda-hip parents, people who had an iTunes gift card and no idea what else to spend it on, and kids passing through Urban Outfitters with $20 to spare and some blank walls to decorate in their college dorm rooms. I’m not surprised the album didn’t do as well on streaming platforms like Apple Music or Spotify, because listening to it one time, for free—as my colleagues and I did—is enough. So yes, Justin Timberlake’s album is currently No. 1—but don’t be impressed. 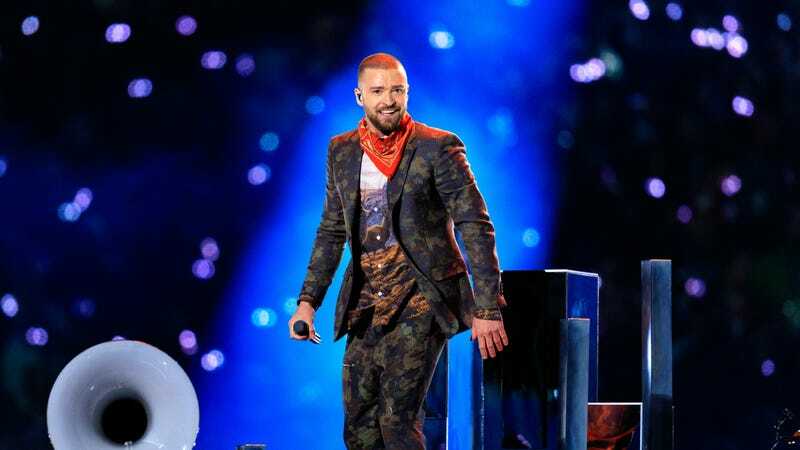 Four out of five of JT’s solo albums debuted at No. 1, and his first solo album, Justified, debuted at No. 2 back in 2002. In all of those cases, he sold many, many more copies in their first week out than he has for Man of the Woods. Hang in there, Justin—at least you have Selfie Kid. I Don&apos;t Forgive You, Justin!! !